CALGARY - The head of one of Canada's big railways says if Alberta's new NDP government needs to raise taxes, his company is prepared to pay its share. 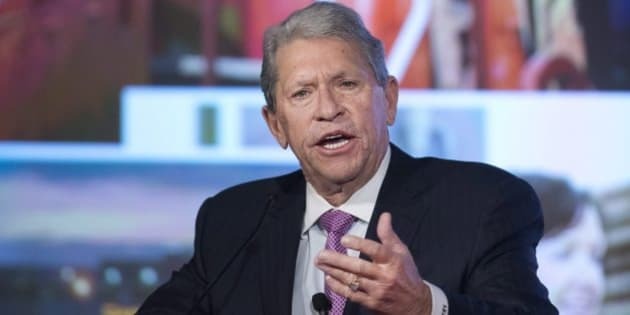 Hunter Harrison, CEO of Canadian Pacific Railway, says times are tough in Alberta right now and the government is going to have to control its deficit. He says if that means raising taxes, then Calgary-based CP is willing to pay up. The NDP under leader Rachel Notley won the election last week on a platform that proposed raising taxes for corporations and the rich. Business reaction to Notley's election has been mixed. Executives have indicated a willingness to hear the new premier out, but some have expressed concerns about business tax increases at a time when the Alberta economy is down. The plain-spoken Harrison says the government has to do something. "If there are fiscal problems here, which there are with the oilpatch and all, and our tax bill has to go up like everybody else's, look, we are willing to pay our share," he told shareholders at CP's annual meeting Thursday. He used an increase in fuel taxes as an example when speaking with reporters later. The Progressive Conservatives hiked fuel taxes by four cents a litre in the budget brought down before the election, and the NDP says it will keep that in place. "I'm told that the Alberta fuel tax is relatively low compared to other provinces, so if they ask us or if they impose another per cent or two fuel tax, we are not going to lie down and cry," Harrison said. "Somebody has got to pay the bills. We're a citizen here and we take the good, and we have to help with the bad times, and so we are willing to do our fair share." During the election campaign, the NDP promised to raise corporate taxes to 12 per cent from 10 per cent, putting Alberta on par with Saskatchewan and one percentage point higher than British Columbia. The party also said it would review the province's royalty structure to ensure Albertans are getting their fair share of resource wealth. Since her win, Notley has been reaching out to executives in the oil industry to reassure them that no big decisions will be made without their input. On Thursday, The Canadian Association of Petroleum Producers announced it has struck an industry group to liaise with the new government. "Albertans voted for change," president Tim McMillan said in a statement. "We are prepared to work with the new government to explore and embrace the best change possible."